Are you an emerging or established writer or artist who wants to see their name in print? 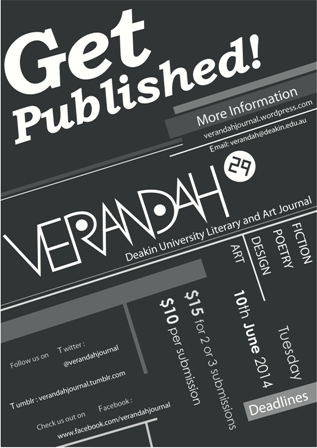 Want to be a part of Verandah Journal’s 29th edition? Well, you’re in luck because Verandah Journal is seeking submissions for its 29th edition, which launches later this year. Verandah is looking for all previously unpublished fiction, nonfiction, poetry and art.This could include, but is not limited to, flash fiction, scripts, think pieces, photography, collages, sestinas and personal essays – you name it! Everyone published will receive a copy of the finished journal, which will be launched at the Melbourne Writers Festival in August. So don’t be shy – send them your work! Entry is $10 per submission or $15 for 2 or 3. Submissions close 10th June. This entry was posted in Arts and tagged opportunity, publishing. Bookmark the permalink.